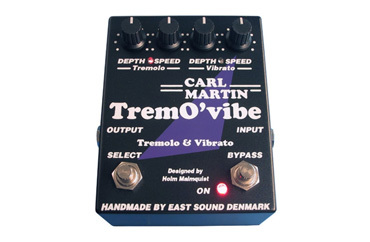 The Carl Martin TremO´vibe is an analog "two in one" effect pedal consisting of a tremolo and a real vibrato, both with independent sets of speed and depth controls. Featuring two switches, The "on" switch allows you to engage or bypass the unit. The "select" switch allows you to switch between Tremolo and Vibrato.